Most of the Republic of Botswana, a flat landlocked country of 2 million people about the size of Texas, lies in the immense Kalahari Desert. One of the most sparsely populated countries in the world, it has transformed itself from dire poverty to a vibrant, fast-growing economy since gaining its independence from Britain in 1966. 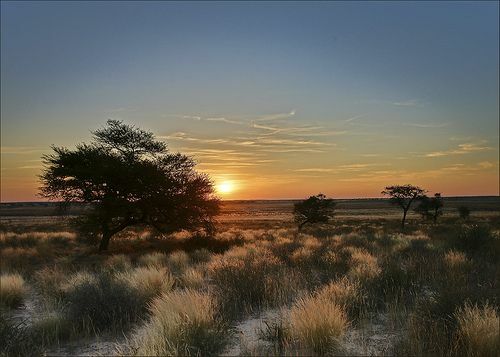 An area as large as Massachusetts is occupied by the Botswanan section of the Kgalagadi Transfrontier Park, which it shares with South Africa. In this book, it is managed by Director Vusi with a scant handful of staff. This morning Monzo, who compiles the wildlife statistics, has missed yet another staff meeting and is not answering his radio. He had told Ndoli that he was going out to check that a group of Bushmen he had spotted recently weren't poaching in the park. Ndoli goes in search of him and finds his jeep abandoned and Monzo, fatally injured, lying at the bottom of a ravine. Three Bushmen surround him, trying to revive the dying man with water. When Monzo dies of his injuries and a bloody rock is found nearby, Inspector Lerako immediately arrests the three Bushmen for his murder. Khumanego, a Bushman living in the modern world, calls his friend and onetime classmate Assistant Superintendent David Bengu of the Botswana CID for help. The Bushmen are rarely violent, and Khumanego believes the men are being railroaded by a bigoted policeman. The evidence is very thin––merely the absence of other footprints in the rocky area and Mongo's statement that he was going out to find them. Bengu, whose nickname is Kubu because of his size––"kubu" being the Setswana word for hippopotamus––presents the case to Superintendent Mabuku, and asks permission to work it. Mabuku at first flatly refuses, but when Cindy Robinson, an American reporter interested in the Bushmen, files a story on the case Mabuku grudgingly agrees that Kubu can "assist" Lerako in the investigation. Kubu, normally an even-tempered home loving man, feels almost a guilty relief to be away from his wife Joy and new daughter Tumi for a few days. At two months, Tumi is still waking several times every night; and to Joy's increasing exasperation, Kubu never hears her. 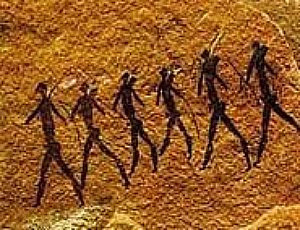 The Bushmen, or San, think of themselves as "The First People." Recent genotyping research seems to support this claim, tracing their unique divergence back over 100,000 years. They have an unusual golden-brown undertone to their skins and are shorter than most races, with adult men rarely reaching five feet in height. 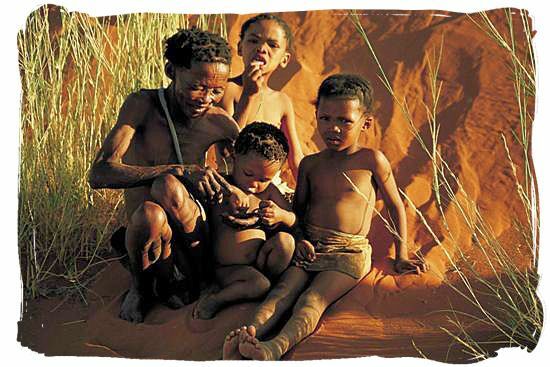 Many are still hunter-gatherers, roaming the deserts and veldts in small family groups. They have no concept of private property, which often brings them into conflict with their neighbors in the world of today. They are an ancient people on the edge of extinction or assimilation. While they live lightly on the land and have left no vast ruins or monuments, the San have left their mark in many hundreds of caves in the Kalahari. Both religious and aesthetic, this stunning record of their lives can be tracked over thousands of years. In fact, this book opens with the journey of a Bushman and his adolescent son to the most sacred and secret of these places. To Kubu's surprise, his friend Khumanego offers to go with him and act as his translator to the Bushmen. Khumanego is passionately convinced of the innocence of the Bushmen, but his pleas to release them have fallen on deaf ears; Lerako remains stubbornly convinced of their guilt despite being unable to find credible evidence. "When a kudu dies after we have hunted it, we feel its pain, and at the same time it knows it is providing for us. We have a shared purpose. We never hunt for more than we can eat, because if we did, it would be robbing the animal we had killed. Stealing its destiny. The world would get out of balance. Bad things would happen." "When we stop in the desert, we never eat all the food that is available. Or drink all the water. We always leave some for those who come after. 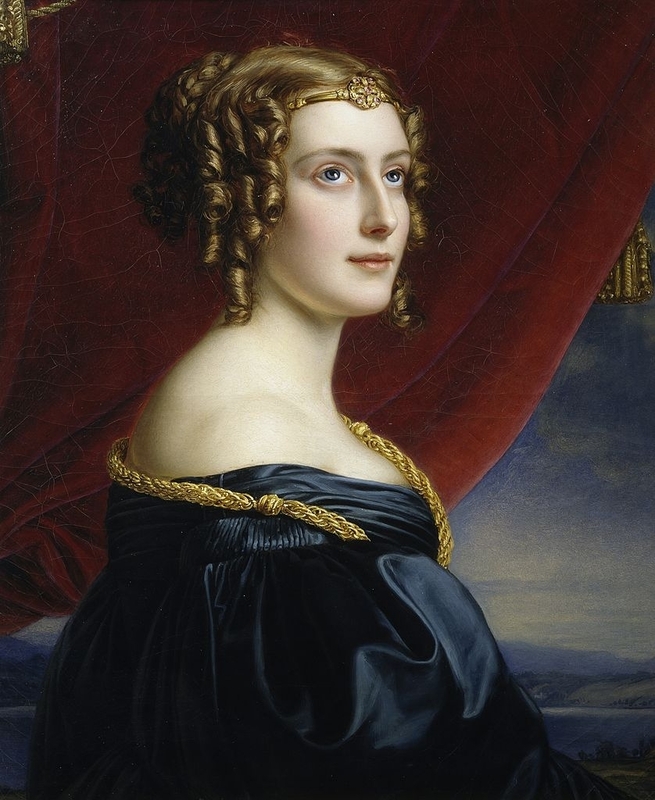 We would rather take hunger and thirst with us than leave it behind." "We are all part of the same world. All connected. That is why the men you have arrested did not kill the man who died. Bushmen don't kill other men. If they did, they would be killing themselves." Not until several other violent crimes have been committed, all apparently linked to the same area of low hills, is Lerako persuaded to release the three Bushmen in his custody. While the story here is convoluted, the careful reader can solve the mystery ahead of the police. The characters are well developed, especially Kubu and his family, who I would enjoy meeting again. The desert setting is stunning and harsh, a far cry from the gentle Botswana of Alexander McCall Smith's Precious Ramotswe. 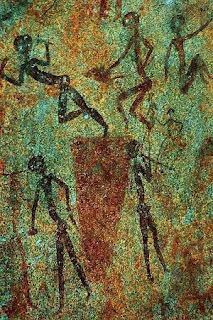 But what I will remember longest from this book are the plight and lives of the Bushmen; their gentleness on the earth and their remarkable art. A people who would "take their hunger and thirst with them rather than leave it behind for another" could teach us a lot about how to live together. Michael Stanley is the pen name of the team of Michael Sears and Stanley Trollip. Sears lives in Botswana, and Trollip in Minnesota and Botswana. Both are regular contributors to the award-winning Murder is Everywhere blog. Death of the Mantis is the third in their Inspector Kubu series, and the first that I have read. Their fourth, Deadly Harvest, will be released by Harper Paperbacks on April 30th. I enjoyed the first two books in the series tremendously and your review whets my appetite for this one. The theme reminds me of 'Unbuntu' - many Africans believe that a community must live harmoniously together, with out the care and watchfulness of their neighbors they are nothing. If a young foolish boy steals something the community cannot let him get away with it, because that would be like stealing from every one, so the thing is always returned. If a bad thing is done to one person in the community by another a retribution is exacted in some way - unbuntu. In short the community takes care of itself. MC, it was genuinely hard to get my head around the values of a culture that owns nothing and practices neither herding nor farming. If you are always following the food and perceive it as simply a gift from an unknowable creator, a few harvesting and hunting tools are all you need. 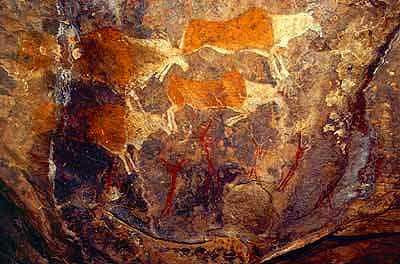 Their art, produced over many centuries and places is infused with light and just breathtaking. I spent hours looking at it.